KUALA LUMPUR, 20 Okt. 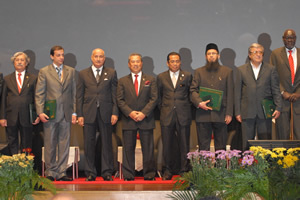 2010 – The Deputy Director (e-Learning) Centre for Academic Advancement of UKM, Prof.Dr Mohamed Amin Embi yesterday received the “ISESCO Prize in Science & Technology 2010” in recognition of his outsanding contributions in the field of Technology. He received a certificate, a gold medal and a cash award of US$5,000. 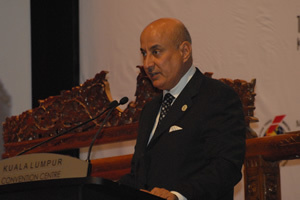 He was among six scientists from Muslims countries given the award by the Rabat, Morocco based ISESCO, a body set up by the Organisation of Islamic Countries (OIC). The other five winners were Dr Hosein Baharvand from Iran (Biology): Prof. Dr Mirsaidon Ulmas of Tajikistan (Chemistry), Prof. Dr Muhammad Qasim Jan from Pakistan (Geology), Dr Odibat Zaid from Jordan (Mathematics) and Dr Shabat Mohammed from Palestine for Physics. 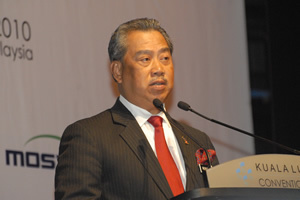 Deputy Prime Minister, Tan Sri Muhyiddin Yassin handed over the awards at a ceremony held in conjunction with the opening of the Fifth Islamic Conference of Ministers of Higher Education and Scientific Research. Present were the Minister for Higher Education, Datuk Seri Mohamed Khaled Nordin and the Assistant Secretary General of OIC, Abdul Moiz Bokhari and the Director General of ISESCO, Dr Abdulaziz Othman Altwaijri. Prof Mohamed Amin’s contribution in the advancement of e-learning in Malaysia is evident in his R&Ds and innovations undertaken in the past few years. He is the founder and advocate of online teacher development centre including Virtual Teacher Education Centre (VirTEC), ELT-Online Teacher Resource Center (ELT-TreC), Gerbang Maya Pendidikan Islam (GeMa Islam) an Islamic Education Portal and e-Xra.com. VirTEC is an Asean one-stop online teacher education centre founded and developed by Prof Amin under the Unesco Participation Programme. It was awarded a Gold Medal at UKM Research /Innovation Exhibition and a Silver Medal by the Ministry of Science, Technology and Environment Malaysia at the Invention Competition. He and his wife Rohayati Haroun developed e-Xra C.E.P.A.T as Malaysia’s first computer-based learning-to-read programme to assist slow learners, dyslexic and autistic children learn to read Malay. The programme has successfully helped more than 25,000 children with reading difficulties to read Malay within 3 to 6 months not only in Malaysia but also in Singapore, Brunei and Indonesia. The innovation was awarded a Gold Medal by the Ministry of Science, Technology & Environment at Malaysia Technology Expo 2006. When met, Prof Amin who was delighted to be so honoured, hoped what he had developed could be shared for the betterment of the ummah as a whole. 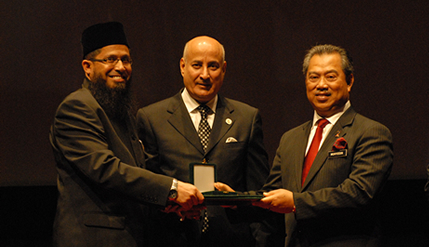 He regarded the award as a recognition for UKM which continues to shine in the international academic arena.